Friendly greetings have been plentiful for Hanley Ramirez this season. Yasiel Puig may have slowed down a little bit, but Hanley Ramirez is still hitting at an amazing clip of late. 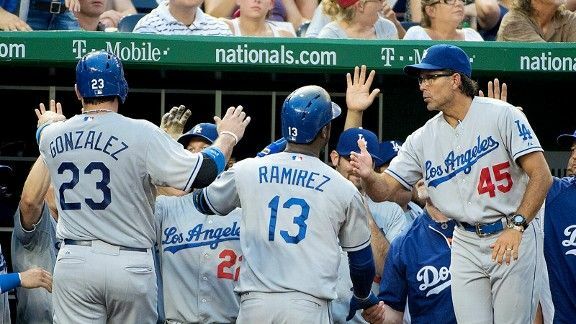 Add three more hits to Ramirez’s ledger, including the game-winning RBI double in the Los Angeles Dodgers' second straight late-game win over the Washington Nationals on Saturday night. He’s now hitting .390 this season and .429 in his last 28 games. Friday it was Andre Ethier delivering the game-winning homer against Rafael Soriano. This time it was Ramirez’s turn. This was Ramirez’s eighth go-ahead hit this season. Amazingly, that’s the third most on the team despite the fact that Ramirez has played in only 41 games (less than half of the Dodgers' games this season). While Puig is struggling to hit anything, Ramirez is hitting everything. He entered the day 30-for-70 in at-bats ending with a fastball, but saw only four fastballs on Saturday, one of which he smacked for a hit. The other 10 pitches were changeups, curves and sliders. Ramirez got one hit off a changeup, and the game-winner against a slider. He’s a combined 19-for-48 in at-bats that end with the latter two pitch types this season. The RBI double gave Ramirez 81 RBIs in 114 career games against the Nationals. He's played more than 100 games against three other teams -- the Braves, Phillies and Mets-- and he's yet to clear 50 RBIs against any of them. Ramirez is a .341 career hitter against the Nationals. He's hit .300 or better against them in six of his previous seven seasons. A little more detail on Puig’s issues: He went 0-for-5 with three strikeouts Saturday, giving him a .179 batting average with no RBIs in his last seven games. Since hitting the wall in Colorado, Puig has missed on half of the swings he's taken. Adrian Gonzalez and Ramirez hit back-to-back ninth-inning homers to beat the Padres 3-1 on June 23. That started a run in which any time the Dodgers have needed a big hit late, they’ve gotten one. The Dodgers are 19-5 since June 23. In that stretch, they’ve gotten nine go-ahead hits in the seventh inning or later, one more than they had in all games this season prior to that stretch. Ramirez has two of those hits, the other being a 14th-inning homer against Josh Collmenter in a win over the Arizona Diamondbacks. Puig and A.J. Ellis also each have two in this stretch. • Use the dropdowns to select sortable information about the player. • A color will appear when there are at least five at-bats using the selected criteria. • Click on the image to receive the averages that correspond with the data. • The raw data will appear when there are fewer than five at-bats using the selected criteria.